nataaero's podcast: NATA at S&D: Demos of New Products, Opportunities to Win Great Prizes and more! In this episode, NATA’s Mike France and Shannon Chambers discuss the association’s plans for showcasing our new products, services and events at the upcoming Schedulers and Dispatchers Conference (February 6-9). NATA will be on hand for both scheduled appointments and walk-up meetings during the 2018 Schedulers and Dispatchers Conference (Booth 840). Schedule your appointment now with NATA staff and see demonstrations of the association’s new products and services. 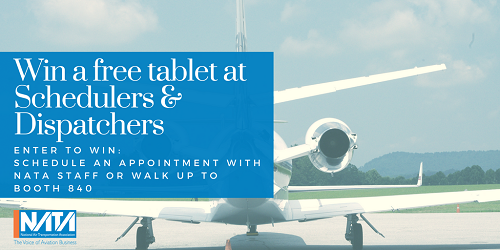 Attendees with walk-up meetings will receive one entry in a drawing to win a tablet. Those making appointments in advance will receive two entries upon arrival at their scheduled time. NATA will also give away a $200 Visa gift card during an onsite social media contest. Follow NATA on Twitter for more information. The association is also holding its annual business card drawing. Winners will be selected to attend the popular FBO Success Seminar and Certified CSR Program.